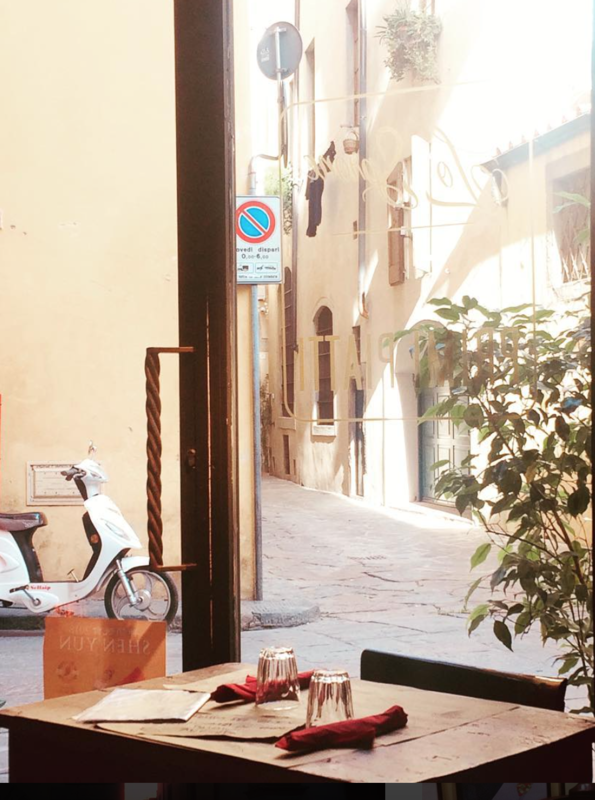 One evening I got lost down the rabbit whole that is Instagram and came across a new blogger and writer, Mundy Walsh who runs The Notion Reel, who although Irish, lives in Florence. We got chatting about the romance of weddings in Italy and Italian styled wedding dresses. She has kindly allowed me to share one of her stories about an Italian Wedding. This is for anyone considering about a wedding in the wonderfully romantic Italiano! My delightfully organised American friend Olivia was getting married to an Italian. She used to be my flatmate in Rome before she moved back to America with her fiancé, Alessandro, and she is the first of my friends to take the plunge and marry Italiano. As she has Brazilian & Italian blood (read she’s just as dramatica as he is) she thinks the intercultural marriage won’t be too much of a shock. The rest of us, however, know otherwise. For starters, Olivia likes to be in control and this wedding saw the get-married-young, cleanliness-is-godliness, boot-camp-loving American marry a so very-Italian chef, food-is-king, Napoletano; in a small town called Avellino; whilst living in America; with the ‘help’ her new Italian Mother-in-Law. She won’t see the flowers, menus, etc. until a week before the wedding. There was only one person with control and it wasn’t Olivia. The venue was the Galassia Park Hotel, just outside Avellino, in the hills above Naples. My friend Francesca met me in Rome and we drove down together but Sat. Nav. or no, we could not find the hotel. We wound around hills, fought with the disembodied voice that took us up dead ends, cursed the wrong directions the locals sitting roadside gave us, and then waved at said locals as we passed them again and again. Up and down, and round and round, we went. Finally, we found the hotel (we’d only passed it twice). Torrential rain hopped off the ground as we ran from the car park to the hotel and wondered vaguely why there were no other cars or people around. “Buona Sera” said Francesca hopefully. Then an elderly woman shuffled slowly to the counter. She asked who we were. We were with the bridal party, we said. There was only one bridal party and it wouldn’t arrive until the next day, she said. We were part of that bridal party, we said. If we were part of that bridal party, why were we here today? She folded her arms. It was another half an hour before we got a room. The next day Olivia waltzed into the reception in a cloud of in-laws and family, tall and tanned and very much the bride-to-be. Her American father, an ex basket ball player, stood head and shoulders above the diminutive, chatty Italians. That night the couple had a party in Alessandro’s family’s house in the mountains. People brought instruments to play – it’s a tradition in southern Italy for the groom to go to the bride’s house the night before the wedding, stand under her balcony, and serenade her. True to showman form, Alessandro sang, minus balcony admittedly, and with a little help from his friends. Later Olivia stood chatting to Alessandro’s father Ugo. They were talking bambini. Or rather, he was talking children and Olivia was trying to change the subject. He thought he could persuade her to call their first son Ugo in line with family tradition. Or Ugetta for a daughter—he was reasonable after all. “If you come to America for the Christening, I will call my bambino Ugo” she announced. Ugo had never been on a plane. Ugo didn’t like the idea of flying. On the day of the wedding Francesca and I escaped early in the morning to get our hair done. We didn’t know where but we presumed that there would be a hairdresser nearby. That was until we discovered it was a Saint’s day. Always sneaking up on you those pesky Italian Saints’ days. After much searching, we found a hairdresser that was open. It had no sign outside and the windows were dark. The only reason we knew it was a hairdressers was because a woman on the street told us, and when we walked closer, we could hear hairdryers. Pulling aside the beaded curtains, we peeked in. Three men in their 40’s sat smoking and turned slowly to give us a united look of irritation. The woman who was drying an older lady’s hair didn’t even bother to look up. We had somehow walked through the looking glass to Corleone. But than I remembered we had no hairdryer in the hotel and I had let my hair dry naturally the day before (what was I thinking?) so… Mafia cover or no they were doing my hair. By the time we left, we had volume to rival a Dallas socialite. I’m not entirely convinced it wasn’t malicious. We tried desperately to rid ourselves of our helmet hair but we still looked like 80’s Italian showgirls in all the photos. Back at the hotel, patience was wearing thin. Olivia’s hairdresser was late, over half an hour to be exact. Alessandro had enjoyed the pre-wedding party a bit too much and was nowhere to be found. There was supposed to be a bottle of bubbly in the room and no one had gone to get it. And, worst of all, Olivia was sweating; “My deodorant’s not working” she wailed, as the photographer snapped ‘getting-ready’ photos, crooning bella, bella, bella. Downstairs it was like walking into a global summit. There were the Americans who watched the Italians being Italian. There were the Brazilians watching both the Americans and the Italians, not able to communicate with either. And then there were the Swedish and the Germans who tried to avoid the Italians who were observing their every move, and that of any other blonde. When everyone was ready (and quite frankly, afraid to bump into the by now highly strung bride), we clamoured into cars and went to the church of Santa Marie delle Grazie. Frescos covered the walls and an intricately designed gold alter decorated the interior. The heat invaded the church inch by inch through the huge open door making me wish I sat nearer the front. Olivia glided serenely down the aisle in a beautiful lace dress, veil reaching her waist, her black hair swept back off her face. The priest welcomed us and commenced the ceremony. He was the family priest. He liked to talk and as many Italians, used 50 words where five could have done perfectly. This would have been fine had we been seated for his monologue on love, life and intercultural marriages. I mooched from foot to foot in my pretty sandals and with every second I could feel my feet swell against the straps. I found leaning on the back of the bench in front helped (should you ever be in a similar situation). I’ve never seen so many people so eager to pray. Once the ceremony was over the hotel buffet awaited us. The table was about 30 metres long with an array of calamari, squid, pickled vegetables, cheeses, prosciutto and water. Chefs stood to attention ready to grill thinly sliced fillets of fish and meat. Wine arrived after a group of thirsty guests descended on the waiter. Ok, it might have just been me but in my defence I wasn’t the only one who thought that this was part of the main meal. It was just the aperitivo – a snack if you will, before the main meal. If I could have unbuttoned something in preparation I would have. Evviva gli sposi! and Bacio, Bacio! (calls for the happy couple to stand and kiss) interrupted all conversation and in between courses the man beside me whispered that the fish wasn’t as fresco as he’d like – there’s a better quality of fish in Puglia, you understand. I valiantly made my way through all the courses and small talk. I began to feel like a bloated whale. Strangely, this didn’t stop me eating. The speeches, an American addition to the wedding, went on for almost as long as the meal (or at least felt like that) and while relatives were wishing the happy couple the best, the photographer, so as not to disturb the speaker, took it on himself in enact war time protocol, crouching and scuttling between tables, and hiding behind pillars, with the result that people didn’t know where he was going to pop up next and when he did, tried desperately not to make eye contact and/or busied themselves on their mobiles. Emotion clawed at his throat as amore came out in a choked whisper. He raised his glass. He wasn’t used to public speaking. The crowd clapped in support. His voice wobbled but it was better this time. He smiled over at his daughter and her new husband. The crowd cheered as he cleared his throat, determination flooding his face. We all held our breath. His voice boomed over the many Italians who were now on their feet, chanting along with him enthusiastically, like a stadium of supporters cheering on love. There may have been some people in the room who dashed to the toilets or darkened smoking areas to hide a sneaky tear or two. The music started soon after and, as we were in Naples, there had to be the obligatory Tarantella, a dance where everyone forms a circle and dances, the music gets faster and faster. Easier said than done, I can assure you. The heels came off at about 2am, just after dinner finished, and we all went out in the garden. Six varieties of dessert, including the wedding cake (which must be eaten otherwise it’s unlucky) were lined up on a long table and we milled around wondering if we really could fit another bite. Well maybe just one small one. Wouldn’t want to be unlucky.